If the world had edges, they'd be sharp and rimmed with ice, overhanging the abyss of outer space. 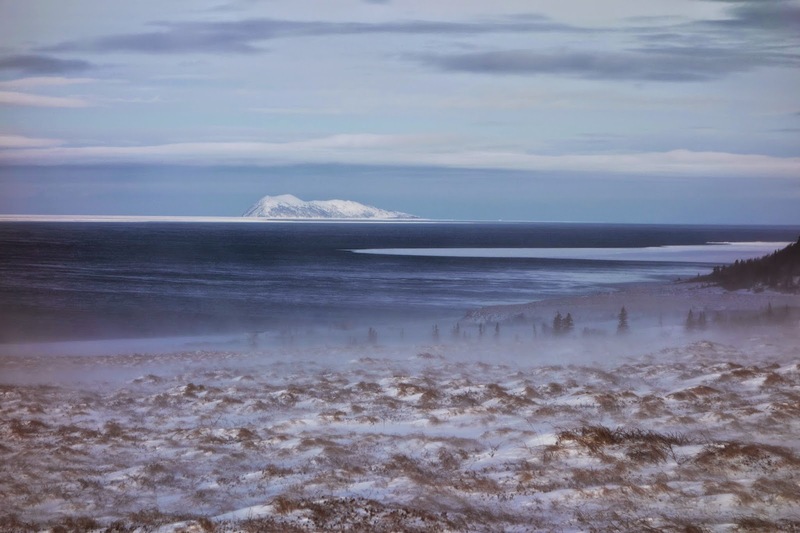 For all practical purposes, the northwestern coast of Alaska is an edge of the world — only made livable by centuries of human ingenuity and our fierce if inexplicable will to survive wherever it's remotely possible to survive. This has long been a region of nomadic residency, where people followed the whims of nature to better opportunity. In the past several decades, folks built a few permanent towns, and a trail linking them together. The towns have all the modern amenities, but the trail is still mainly just an idea — a fragile thread woven by travelers who came before, endlessly fraying under the whims of the weather. It's hardly the lifeline one wants to cling to at the edge of the world, but it's all there is, out here. Beat warned me not to start a solo trip at the coast. 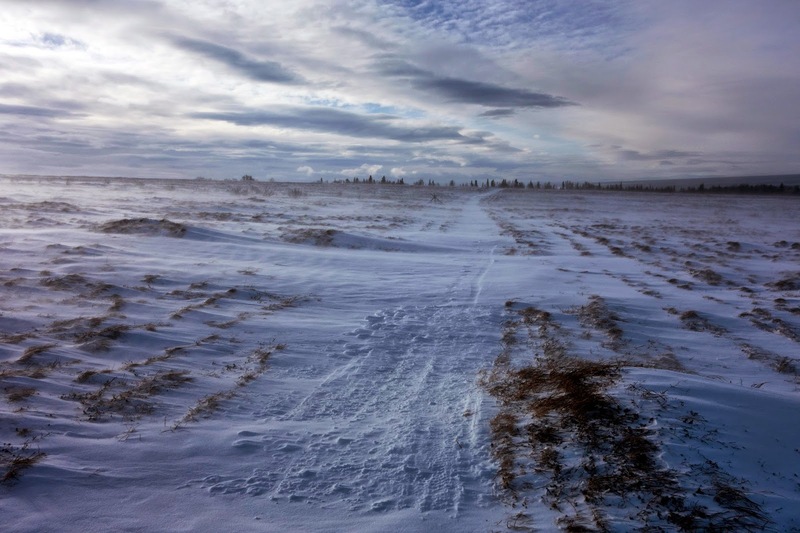 Better to attempt the whole Iditarod Trail than just the coast, he said. "Everything that comes before the coast, is preparation for the coast," he said. I'd seen the friendliest face of the often sinister Alaska Range and watched Beat go through Hell in the Interior, and figured the coast didn't have to be the worst — it could be anything. I knew it would be beautiful. I wanted to see it. But going it alone was intimidating beyond my own expectations. 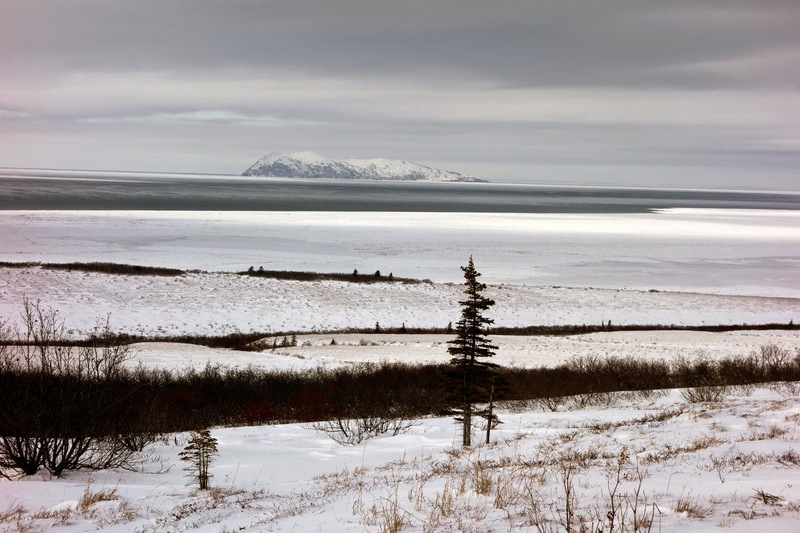 I'm not as independent as I like to believe I am, and that realization struck me as I stepped off the plane in Unalakleet. 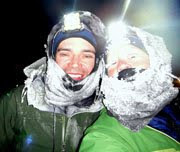 Wind screamed down the frozen shoreline and a wall-mounted thermometer read -5F. A baggage handler herded the passengers inside even though we were supposed to gather our gate-checked luggage at the back of the plane, yelling over the howling gusts that frostbite could happen in minutes. The windchill cut like a razor blade. I dragged my bike box into a storage area and slowly put it together with hands that were visibly shaking. What the hell was I doing? Putting this bike together, by myself, to go ride it into the barren wilderness, all alone. I didn't actually want to be here, at all. Pedaling away from the airstrip, it took all of my strength to keep the bike moving in a straight line, leaning against gale-force crosswinds as I fumbled with my face mask. I'd arranged to rent a room from the guys who run Peace on Earth pizza, specializing in homemade dough and fresh toppings at the edge of the world. I figured Unalakleet was a small enough town that I'd just run into it, but somehow made enough turns to put myself nearly back at the airport. 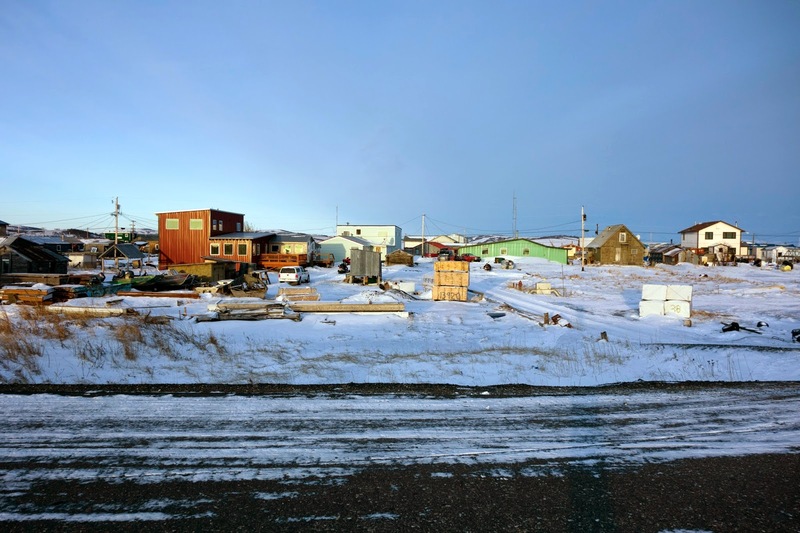 People were emerging from their homes because there was buzz that the leaders of the Iditarod Dog Sled Race were minutes from town — Aaron Burmeister, Aliy Zirkle, and Dallas Seavey. I wanted to join in the spectating excitement, but mostly I just wanted to find a quiet place to throw up. Eventually I ran into a pilot making his way to the pizza place, and followed him to the thin comfort of a heated building. I'd formed a loose plan of touring the trail from village to village over one week, but gave myself a comforting stipulation that I could take a few extra days to wait out bad weather. I told the pizza guys I'd probably lay over an extra day in Unalakleet, but would wait to see whether the 35mph winds let up in the morning. At 8 a.m. the windows of my room were still rattling, but everyone who knows this region knows that the wind always blows, so I packed up my bike anyway. Bret the pizza guy cooked me an unexpected and free egg and pancake breakfast — practice for all the Iditarod volunteers coming over in an hour, he said — and cheerfully bragged about his son who competed on the television show America Ninja Warrior, to air this May. "He trains right over there on the beach," he said, pointing out the window to a fifteen-foot wooden ramp and other hand-built obstacles, encased in ice and snow dunes. "That's amazing," I said. 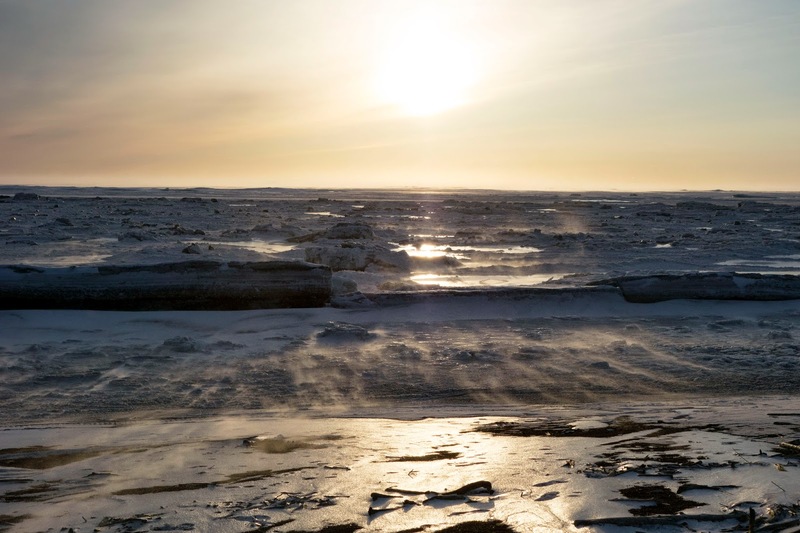 If a kid from rural Alaska can train to be an American Ninja Warrior on this icebound shoreline, perhaps a bike ride wasn't as impossible as it seemed. 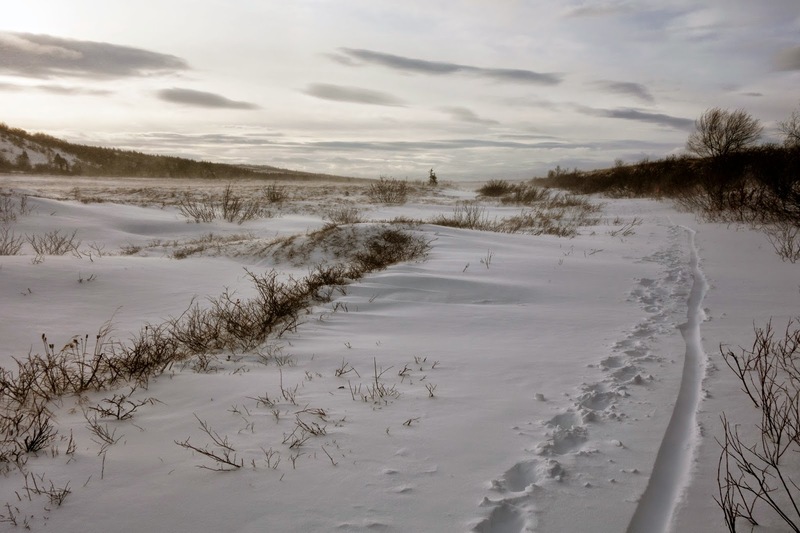 Even amid what I expected to be heavy traffic during the dog sled race, the trail was already buried in spindrift — fine-grained snow that looks and feels exactly like sand. It's been tumbled around by the wind so long that the crystals have been polished to a sphere, and the water content is so low that it won't compact under foot, wheel, or snowmachine track. It can't be ridden, and wading through the loose grains requires consistently strenuous effort. Every hundred yards I needed to stop to catch my breath and let my heart rate slow to a manageable hum. Each time, I turned around and watched my own tracks disappear in seconds. Ok, so this was going to be a hard day. That's okay, because it was the first day, my legs were fresh, I'd eaten most of a pizza piled with a salad's worth of vegetables the night before, plus breakfast in the morning, plus I had a full three days of food on my bike. It was just under a hundred miles to Koyuk, where I'd sent my first food drop. Seventy-two hours, even if I had to push my bike through most of the first hundred miles, seemed reasonable. At least it's not too "cold," I assured my trembling resolve. "It might even be above zero degrees." The windchill effortlessly cut through these weak lies. All day long I was passed by friendly mushers. Some asked if I was "one of those Idita-bikers." "No, no, I'm just on a short trip," I'd reply. "Touring the trail." They'd give me a slightly disconcerted look that reflected my own inner questioning of where exactly I went wrong in life to consider this a vacation. There were short sections where the trail was still mostly blown clear of spindrift, and I could ride nearly as fast as the dogs were running. But then there were the direct climbs up several hundred feet of seemingly endless Blueberry Hills, where bracing my bike while digging for foot anchors in the bottomless drifts took every ounce of strength even when I wasn't moving at all. One musher who'd probably watched my struggle from the lowlands for the past ten minutes playfully heckled me as he passed. "I thought you were Hugh Neff because you were moving so slow." It was hard work, but all in all it wasn't that bad. The frozen coastline was beautiful, and the difficult climbs afforded spectacular views of these wide-open, empty expanses that I both deeply love and fear. It's these contrasts of emotion that I seek — the desolation speaks to the wonder of life, and the loneliness reverberates as intense appreciation for the people I love. 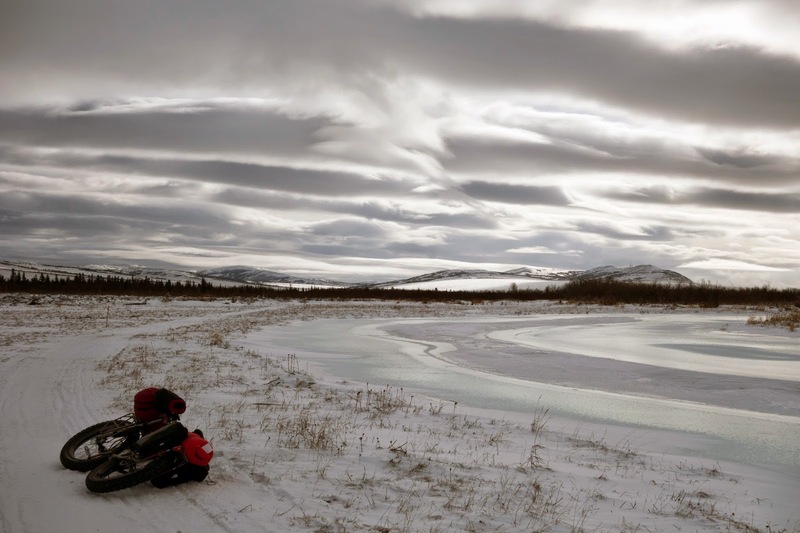 I thought frequently about Beat, who after his ordeal in the deep snow and cold of the Interior, was making his way down the Yukon River, toward me. "I'm going so slow, he might just catch up," I thought. Later in the afternoon, the wind calmed somewhat but the sky darkened, and flurries of snow started to fall. 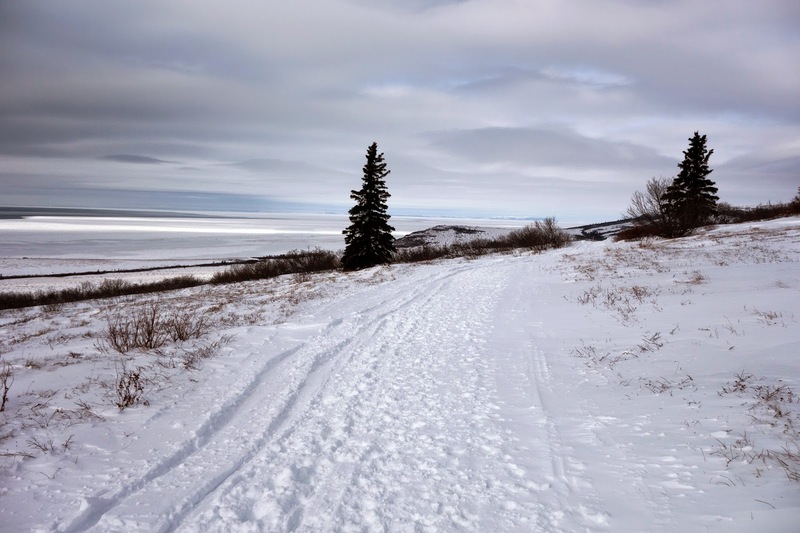 That's exactly what this barely existing trail did not need — more soft snow — but this is the Iditarod Trail, and it is what it is. The relative quiet after a day of eardrum-jarring wind was such a relief that I didn't even really care when the snowfall picked up momentum. 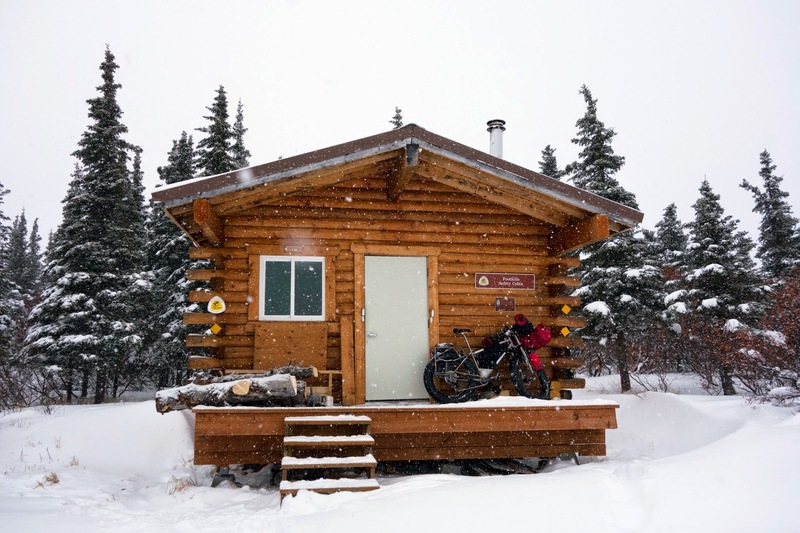 The Foothills Cabin is only 24 miles north of Unalakleet, and had hopefully been penciled in as my lunch stop for the day. But by the time I reached the cabin, it was already evening. I knew the peril of holing up in the early stages of a snowstorm rather than pressing forward before the trail was further buried. But I was already very tired, and this was my vacation, dammit. 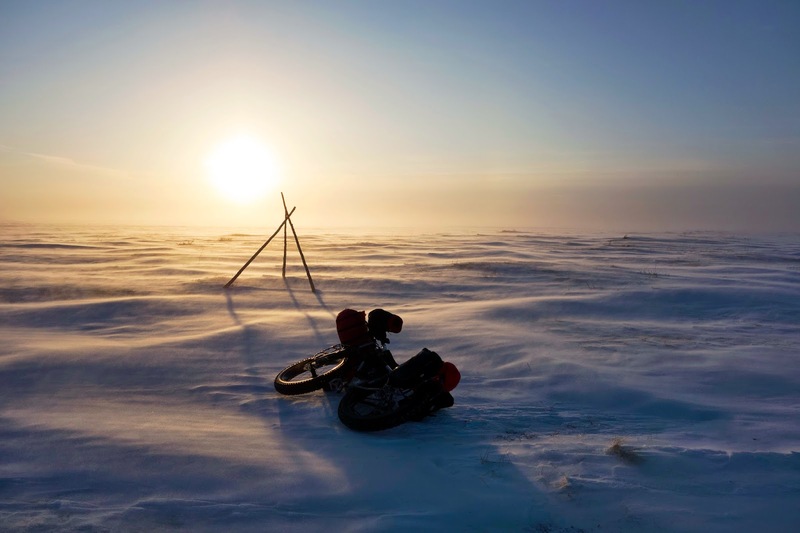 Beat and I connected by sat phone and I told him about the excuse I'd cooked up — this snow and wind event was not something I wanted to meet during a sea ice crossing, which at my pace was still a very long night and half day away. Better to break up the first leg into two days and aim for better-forecasted weather on Wednesday, which Beat agreed was sound reasoning. "Sisyphus teaches the higher fidelity that negates the gods and raises rocks. He too concludes that all is well. This universe henceforth without a master seems to him neither sterile nor futile. Each atom of that stone, each mineral flake of that night-filled mountain, in itself forms a world. The struggle itself toward the heights is enough to fill a man's heart. One must imagine Sisyphus happy." Listening to snow softly pummel the plexiglass window, I thought with a smile, "This really is the life." I've been looking forward to this update. As usual, wonderful writing and pictures. I can't wait for the next update on Beat and on your inexplicable vacation. "...questioning...where I went wrong in life to consider this a vacation." This made me smile in recognition. The rest of it, you really put words together so beautifully. Looking forward to the next installment of the story. I've been following your posts on Facebook since you and Beat left for the ITI and Unalakleet, anxiously awaiting to hear the more complete story on your blog which I much prefer. Your words and photos always complement each other so well. "...questioning...where I went wrong in life to consider this a vacation" also made me laugh. I expected a travel log. I read instead a thoroughly engaging story. Very eloquent and raw. Good stuff. Really nice writing, and pictures to back it up!